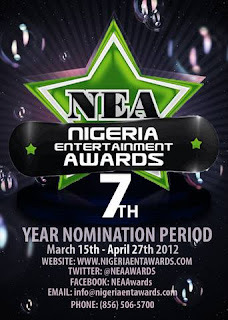 The organizers of the Nigerian Entertainment Awards (NEA) are calling on all members of the entertainment industry to begin submitting their work(s) in order to be considered for nominations, and ultimately awards in the upcoming 2012 NEA Awards. It is that time of the year again, when members of the entertainment industry are given the opportunity to be celebrated, and recognized by the NEA and their fans both at home in Nigeria and abroad. Between now and April 27th, the NEA will be compiling work released into market, radio stations and online media over the past year (March 2011 – March 2012), for consideration in the different award categories. The deadline to submit nominations is April 27, 2012 and the official announcement of the 2012 NEA nominees will be made at the end of May, 2012. Please forward all materials to neaawards@gmail.com and for more information visit the NEA website www.nigeriaentawards.com. The NEA AWARDS is an annual entertainment event held in the United States, with the sole purpose of celebrating and recognizing the numerous contributions of entertainers to the African entertainment industry, while at the same time promoting the image and rich culture of Nigeria.